The event will be held at the Scottish Parliament. The former new town of Glenrothes is to be honoured at Holyrood next week as the town’s 70th birthday celebrations kick off in earnest. 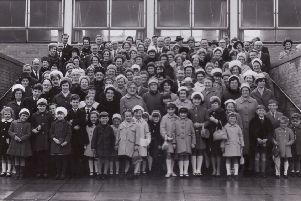 Around 100 residents and those connected with the town over the last 70 years have been invited to attend the special evening which takes place in the members’ restaurant at the Scottish Parliament in Edinburgh on June 6. The special gathering is designed to recognise the work being done by a great many local organisations, schools and individuals and will be hosted by the town’s MSP Jenny Gilruth, in conjunction with Glenrothes and Area Heritage Centre. “The town’s 70th birthday is an important milestone in the story of Glenrothes and across the town community groups and schools have been working hard to mark the birthday,” Ms Gilruth told the Gazette. The evening will also be a celebration of Glenrothes through the ages with a display and several presentations. Linda Ballingall, chairman of the Glenrothes and Area Heritage Centre, said: “We are delighted to be co-hosting this milestone event marking another decade in the life of Glenrothes. “We will also stage an exhibition of photographs, power-point presentation and introduce guest speakers. “Unfortunately, there will be disappointments, as due to allowable space within the parliament building we have had to limit the number of invites. “The Heritage Centre therefore concentrated on inviting those in the community responsible for founding the various organisations, some of whom are now into their 80s. And as well as other various forms of entertainment, the winner of the Jenny Gilruth 70th birthday poetry competition will also be announced. The Holyrood event triggers the start of a busy month for the town with a series of events and celebrations including a family fund day and live music event to be staged at Warout Stadium on June 30. Meanwhile, free wristbands for the family fun area will also be given out, with the opening being preceded by a an hour long session from 11am until noon being dedicated to children with disabilities or additional support needs. And after last year’s huge success, Glenrothes plays host to the return of the ComicCon event at Rothes Halls on Saturday, June 9.